TECHNOLOGY-PORTFOLIO.NET - After the V30 Signature Edition released in December last year, LG is reportedly preparing a new high-end categorized "super premium", this time taken from the V35 ThinQ model. Smartphone is reportedly going to be named the full LG V35 ThinQ Signature Edition and scheduled official launch in August. LG V35 ThinQ Signature Edition may be a reflection of the nickname "super premium" earlier. According to information circulating on the internet, this phone will be priced at 2 million won or 1800 USD. What's the difference LG V35 ThinQ Signature Edition with V35 ThinQ "regular" edition? LG V35 ThinQ Signature Edition is mentioned will be wrapped with scratch-resistant luxury material and has 6 GB of RAM and 256 GB of storage. LG V35 ThinQ rely on Snapdragon 845, considering that the chip is the top model of Qualcomm today. There are also dual cameras on the back like the regular LG V35 ThinQ version. LG V35 ThinQ Signature Edition will reportedly get a special line for maximum customer service. LG V35 ThinQ Signature Edition also seems to be sold limited. 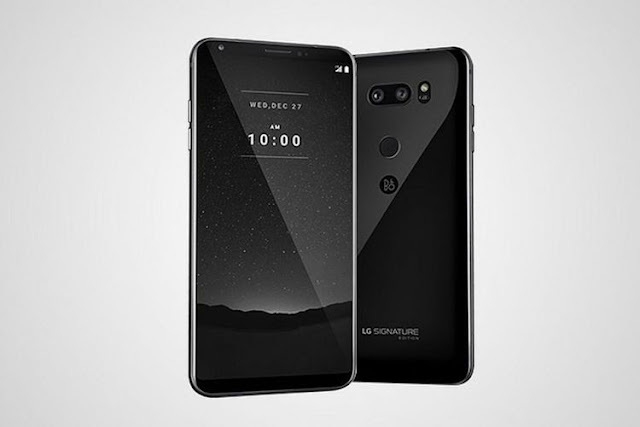 Super premium mobile phone products before, LG V30 Signature Edition, just teredua as many as 300 units that immediately sold out hunted buyers in South Korea. LG is not the only manufacturer that makes mobile phone category "super premium" worth much more expensive than the flagship in general. Huawei, for example, has a mare series of RS Porsche Design, while Oppo.